The Irish might have the gift of the gab, but as a people, punctuality is not one of our Irish gifts. Casual social invitations are vague about time, which can be disconcerting to newcomers in the country. And being late to more formal social engagements does not attract the same level of disapproval it does in North America. While there is a strict legal closing time for pubs, anyone who has been in a pub in Ireland at closing time knows that even with the lights on and the bouncers shouting, many people still saunter out without any sense of urgency. Perhaps this is why no one seems terribly concerned about the Europe Union’s decision to end daylight savings time. As the last clock switch looms at the end of March, the news and social media are fairly silent about the change. We will spring ahead soon, but in the autumn, no one knows yet if we will fall back. Each country must decide which time they will stay with. With Britain posed to leave the EU, the uncertainty about the time takes on a bizarre new dimension. It would be a major adjustment for people in Dublin and London to be in different time zones. But it would be absolutely surreal for people in Dundalk and Newry to be in different times zones. The whole question of the border in Northern Ireland is unsettling for many people on this island after decades of freely crossing an invisible line without a care. But the idea that the North would be in a different time zone than the Republic definitely crosses the line into the ridiculous. Thankfully, our literary heritage shows that our Irish gifts of storytelling and humor include an appreciation for the absurd. It is a mystery how the Irish became so unconcerned with time. Our ancient ancestors were preoccupied with it. In the megalithic era they built elaborate passages in mounds of earth and stone cairns. These were precisely aligned so that only at sunrise on the solstice, the sun would hit an opening above the entrance and illuminate the inner chambers. The elaborate stone carvings on these structures have inspired countless Irish gifts in modern times. 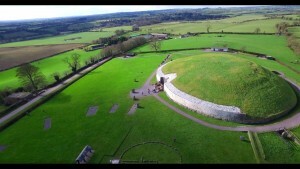 The triple spiral carving from Newgrange in County Meath is the most well-known. Perhaps electrical lighting explains the difference in attitude between modern Irish society and our ancestors. Being so far north, the daylight hours are very short in winter. It is normal for 9-5 office workers to go to work before it is light and to return home after the sun has set in the darkest part of winter. That’s not much fun for modern people. But for our ancestors who depended on the food they could grow to survive, the long, dark days were more ominous. The sun’s movements were central to how they organized their lives. So it makes sense that they were more worried about time than we are today.